Homepage. This page: Press photograph showing the Reliant Scimitar from the mid '70s. 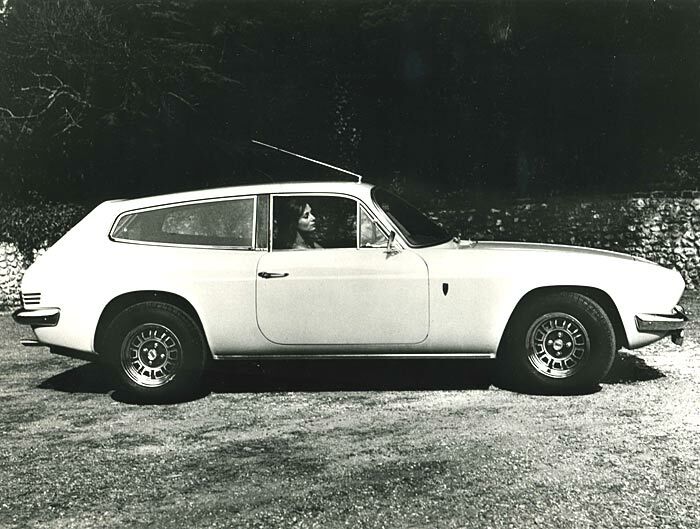 This picture, issued by Reliant, was taken in the early/mid 1970s, and shows their V6-engined Scimitar SE5 coupe, with a dashing young lady at the wheel. The Scimitar line began with the 'booted' Scimitar GT of the 1960s (SE4), built between 1965 and 1970. As with later cars, the GT had fibreglass bodywork, but had a proper boot, unlike the shooting-brake style of the SE5 Scimitar. The SE5 model first sold in 1969, following on from the GTE. In 1971 the SE5a was launched, which visually looked the same as the SE5 but featured a number of engine and interior improvements. In 1975, the sporting estate was significantly re-worked, resulting in the wider SE6 which took over from the 5. The SE5 dropped into a market that had few direct rivals, with just Volvo's P1800ES offering a similar layout. Two doors, yet with the interior space of a proper estate, accessible via a shallow hinged rear screen as opposed to a full tailgate as found on most estates. If you wanted a rapid, occasional load-lugger, then the Scimitar, with its rust-free coachwork and V6 powerplant, was well worth considering, and arguably more stylish than a traditional estate (contemporary estate cars including the boxy Volvo 245, Granada, and various large Vauxhalls). Royal patronage, thanks to Princess Anne, didn't do the Scimitar's image any harm either. Return to the old transport photos - Page 5.